Erected 1994 by High Plains Chapter, Daughters of the American Revolution. Marker series. This marker is included in the Daughters of the American Revolution, and the Santa Fe Trail marker series. Location. 36° 47.199′ N, 102° 48.318′ W. Marker is near Wheeless, Oklahoma, in Cimarron County. Marker is on State Highway 325 3.6 miles north of E0190 Road, on the left when traveling north. Touch for map. 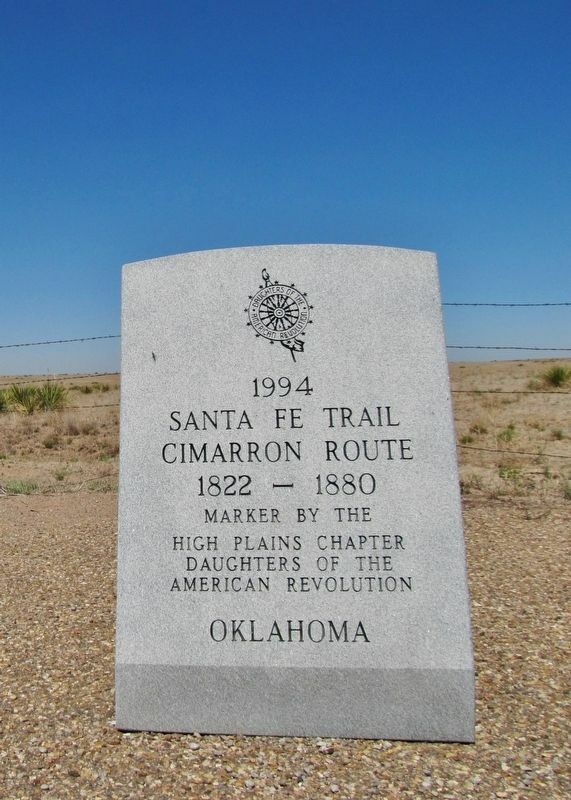 Marker is located in a pull-out on the west side of the highway, at the point where the Santa Fe Trail crossed here from east to west. Marker is in this post office area: Boise City OK 73933, United States of America. Touch for directions. Other nearby markers. At least 2 other markers are within walking distance of this marker. 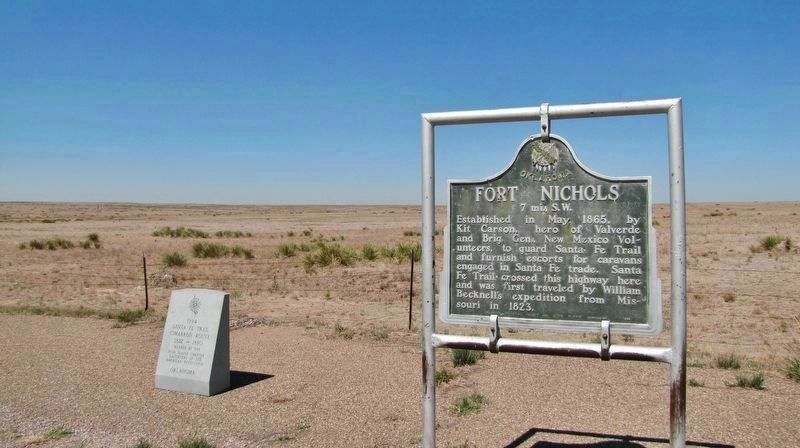 A different marker also named The Santa Fe Trail (a few steps from this marker); Fort Nichols (a few steps from this marker). Established in May 1865, by Kit Carson, hero of Valverde and Brig. Gen., New Mexico Volunteers, to guard Santa Fe Trail and furnish escorts for caravans engaged in Santa Fe trade. Santa Fe Trail crossed this highway here and was first traveled by William Becknell's expedition from Missouri in 1823. Fe Trail wagon ruts running east/west through this location. More. 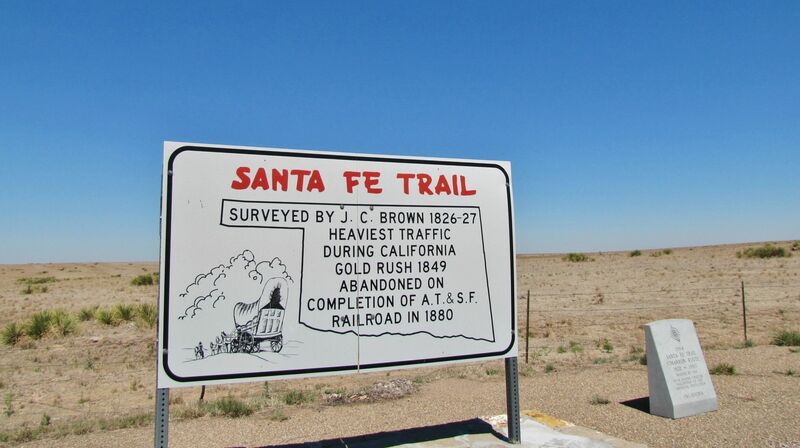 Search the internet for Santa Fe Trail. Credits. This page was last revised on March 22, 2019. This page originally submitted on March 22, 2019, by Cosmos Mariner of Cape Canaveral, Florida. This page has been viewed 102 times since then. Photos: 1, 2, 3. submitted on March 22, 2019, by Cosmos Mariner of Cape Canaveral, Florida.